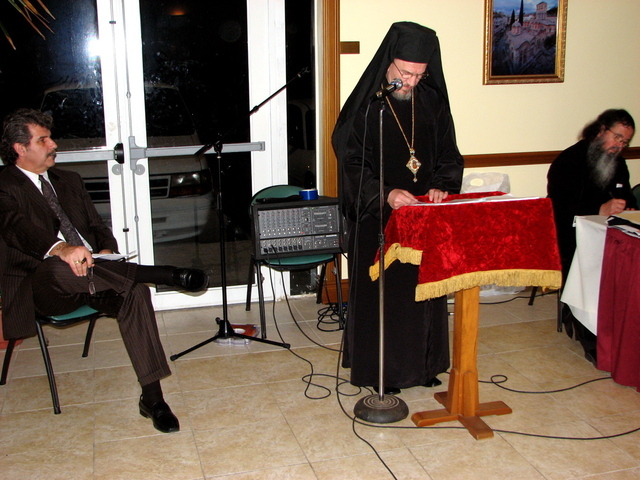 North Miami, FL - His Grace Bishop Dr. MITROPHAN, Diocesan Bishop scheduled the Annual Diocesan Assembly at the St. Simeon Mirotocivi Serbian Orthodox Church in North Miami, Florida. The Assembly was held on February 27-28, 2009. In addition to His Grace Bishop Dr. MITROPHAN, Assembly participants included Diocesan clergy, Diocesan Council members, Audit Board members, parish Executive Board Presidents, delegates and observers. The Annual Assembly reviews the work of the Diocese from the preceding year and establishes goals for the coming year. At the Assembly the Bishop defines and expresses the vision for the Diocese for the present and future. This year for the first time the Assembly heard an address by the winner of the National St.Nikolai Oratorical Festival. The Assembly began on Friday evening with Registration. His Grace Bishop Dr. MITROPHAN officiated at The Service of the Invocation of the Holy Spirit. Very Reverend Stavrofor Rastko Trbuhovich and Very Reverend Stavrofor Rade Merick served with His Grace. Diocesan clergy sang the responses. Diocesan Council Vice President Mr. Rudley Mrvos thanked host priest Protopresbyter Svetozar Veselinovich and the parishioners of the St. Simeon Mirotocivi Church for the gracious hospitality. Mr. Mrvos chaired the Assembly proceedings with the Archpastoral Blessing of His Grace. His Grace Bishop Dr. MITROPHAN’s report to the Assembly included a summary of His extensive schedule of services, work with the Holy Assembly of Bishops, Episcopal Council, Diocesan Council, Diocesan Administrative Board and Shadeland Committee. His Grace reviewed changes in clergy occurring during the year. 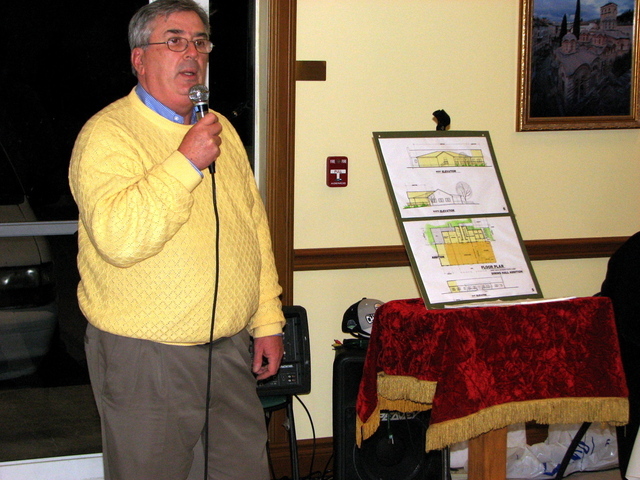 He detailed the extensive construction and renovation taking place in various parishes and at Shadeland. His Grace spoke of the winter retreat at Shadeland and the winter camp held by the the St. Petersburg Deanery in Atlanta, Georgia. His Grace devoted significant attention to the condition of the church schools in the Diocese. He stressed the importance of parishes honoring the fasts of the Church when scheduling activities. Citing St. John Chrysostom extensively, His Grace spoke about the necessity of regular church attendance and worthy piety in preparing for Holy Communion. His Grace said: “It is because of this Mystery that we are Christians. Without it, we are not. Without it the Church is but a club, society, or social institution.” His Grace addressed the crisis in morality and finances in the world and said the two go hand in hand. His Grace announced the Eastern Diocese will host the Sabor in Canton, Ohio on August 10-13. 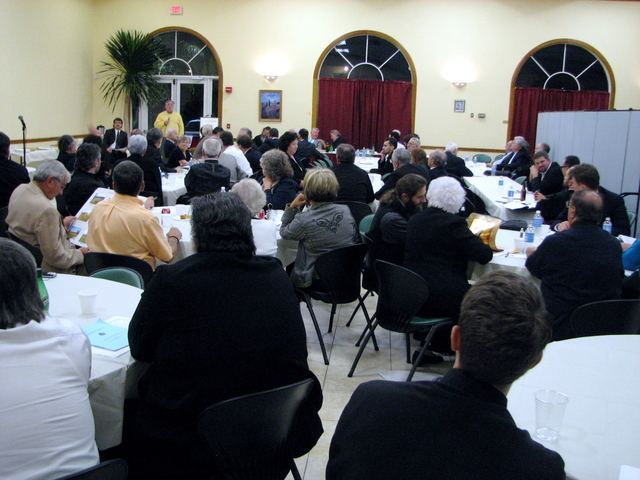 The Sabor will be a time for Diocesan hospitality. His Grace addressed administrative unity with the New Gracanica Metropolitanate under the new Constitution and asked that God grant it to be completed as soon as possible. His Grace concluded His report by expressing appreciation to all donating to the Diocese, churches and monasteries, the suffering people in Kosovo and Metohija and all people in need. Diocesan Treasurer Milan Visnic reviewed the financial reports and the proposed budgets. New budgets were approved for 2009 for the Diocese and for the Diocesan Camp and Most Holy Mother of God Monastery at Shadeland. Mr. Nick Mitrovich presented the Audit Committee Report which found Diocesan records to be in good order. Father Rodney Torbic submitted the Department of Christian Education report which included a cumulative statistical report of attendance by parish and by Deanery since 1986. A chronology of Christian Education Deanery meetings since 1987 and of Clergy Seminars from 1983 was also included. Protonamesnik Rajko Kosic presented the Credentials Report and the Diocesan Relief Report. 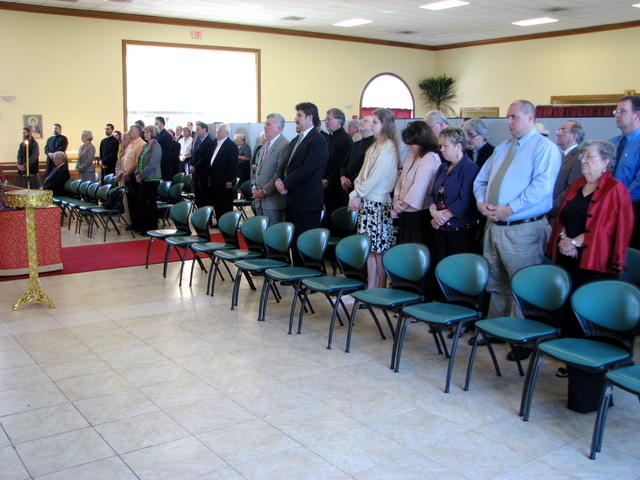 The Credentials report indicated thirty one parishes were represented at the Assembly. Father Kosic’s Diocesan Relief Report detailed assistance provided which included help for Hilandar Monastery, Kosovo, Tsunami, Katrina, and the Banja Luka Orphanage. Father Kosic spoke about the benefits of cooperating with International Orthodox Christian Charities. Mr. John Russin, Construction Manager for the extensive work being done at Shadeland reviewed projects completed and new projects underway. Mr. Russin had photos to show the completed residence for Kolo workers and the new pavilion. Mr. Russin spoke about work to be done on the monastery church including rebuilding the dome and adding a vestibule, restrooms and a utility area. Mr. Russin described the new addition to be added to the “A” building which would include a larger dining hall, a deck and restrooms. Mr. Russin encouraged visits to and support for Shadeland. On Saturday morning His Grace Bishop Dr. MITROPHAN officiated at the Hierarchical Divine Liturgy. Serving with His Grace were Very Reverend Stavrofor Dragoljub Malich, Very Reverend Stavrofor Rastko Trubuhovich and Father Deacon Dragoslav Kosic. A group of Diocesan priests sang the responses. A new feature at the Assembly this year was the presentation by St. Nikolai Oratorical Festival winner Anney Mierski of St.Nicholas Serbian Orthodox Church, Steelton-Oberlin, Pennsylvania. Protopresbyter Stevo Rocknage, Sabor Youth Ministry Committee Chairman and Rebecca Kesich, National Coordinator of the Oratorical Festival gave introductory remarks about the oratorical contest. Anney Mierski spoke on the theme “I believe…” She talked about believing every word of the Nicene Creed. She talked about the Ten Commandments and the way they relate to personal life. 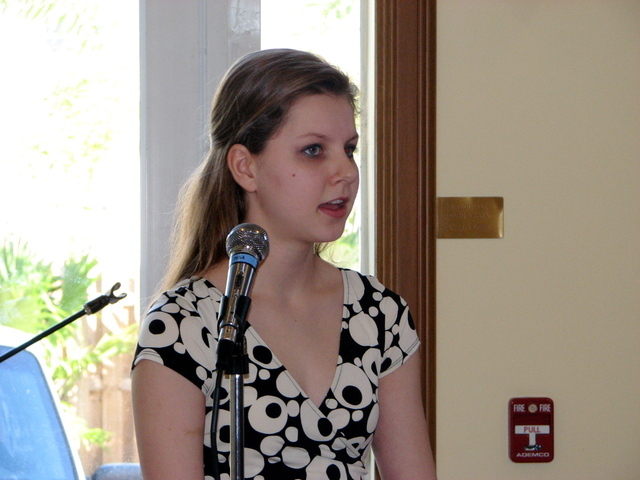 Anney Mierski gave the example Christ’s commandment to love one another as it applied to her personal life in school. Anney told of the testing of her faith this past summer when both of her Grandmothers departed this life. Anney Mierski said: Believing in the Orthodox faith means practicing it not only inside the church but outside as well.” She was soundly applauded by the Assembly for her presentation and was awarded a financial prize from the Diocese. Father Rastko Trbuhovich, the featured speaker selected by His Grace Bishop Dr. MITROPHAN, engaged the Assembly participants in a dialogue. Speaking in Serbian and in English, Father Trbuhovich, focused on the topic of the parish, the local church. Father Trbuhovich drew heavily from Ephesians, Chapter 4 to define “Who is the Church?” He addressed becoming a member of the Body, and focused on the Divine Liturgy as the center of Church life/Parish life. 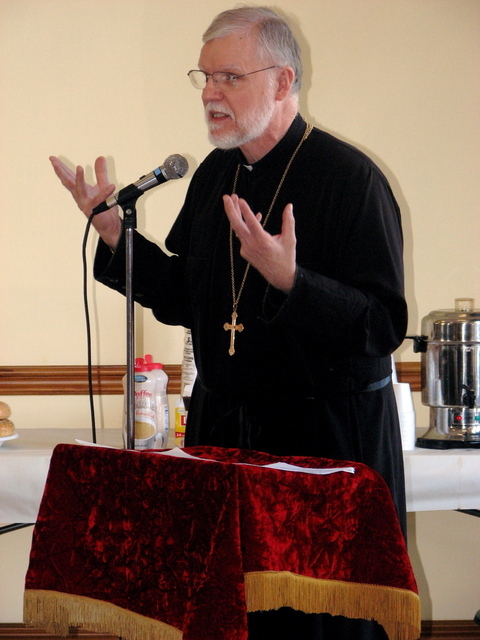 Father Trbuhovich gave illustrations of the interconnectedness of everything in the Church and said all work of the Church is the work of Christ. He spoke of sinfulness, Confession and reconciliation with God. Citing Holy Bishop Nicholai, Father Raskto encouraged the Assembly participants to be zealous in serving God. Father Trbuhovich concluded his talk with themes of harmony and forgiveness. Mr.Kosta Papich reviewed the progress made on the St. Sava Cathedral –Vracar. Mr. Papich cited the important contributions of this Diocese particularly as construction was getting underway. He said the goal is to complete the St.Sava Cathedral-Vracar within four years. Contributions are still needed and are encouraged. Protopresbyter Stavrofor Rade Merick authored the numerous resolutions adopted by the Assembly. The resolutions included praying for the health of, greeting and asking the blessing of His Holiness Patriarch PAVLE. The resolutions expressed belief in the administrative unity of the Serbian Orthodox Church in North and South America. Greetings and unity were expressed with Orthodox Christians throughout the world. The resolutions included condemning the unilateral and illegal declaration of “independence” by the Albanian-dominated parliament of the Serbian province of Kosovo and Metohia. Solidarity was expressed with His Grace Bishop ARTEMIJE of Raska and Prizren together with the clergy, monastics and faithful of his Diocese. The present economic crisis is viewed as an opportunity for spiritual correction and the helping of individuals in need. The resolutions included a pledge to make the forthcoming Sabor productive, memorable and enjoyable. The exemplary hospitality of the St. Simeon Mirotocivi Church at this Assembly was fully and joyfully recognized. The offer of St. Sava Serbian Orthodox Cathedral of Cleveland, Ohio to host the next Assembly was accepted. The Assembly concluded with prayer.